Department of Medicine, Hematology/Oncology, Lineberger Comprehensive Cancer Center, University of North Carolina, Chapel Hill, North Carolina, USA. Address correspondence to: Paul M. Armistead, Department of Medicine, University of North Carolina, Chapel Hill, 450 West Drive, North Carolina 27599, USA. Phone: 919.843.6847; Email: paul_armistead@med.unc.edu. J Clin Invest. 2019;129(2):506–508. https://doi.org/10.1172/JCI126116. Neoantigen-targeted therapies have typically been based upon personalized neoantigen-specific vaccines; however, in this issue of JCI, van der Lee et al. 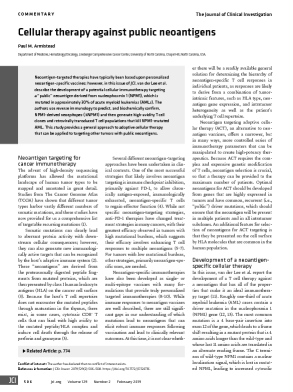 describe the development of a potential cellular immunotherapy targeting a “public” neoantigen derived from nucleophosmin 1 (NPM1), which is mutated in approximately 30% of acute myeloid leukemias (AMLs). The authors use reverse immunology to predict, and biochemically confirm, NPM1-derived neoepitopes (ΔNPM1) and then generate high-avidity T cell clones and retrovirally transduced T cell populations that kill NPM1-mutated AML. This study provides a general approach to adoptive cellular therapy that can be applied to targeting other tumors with public neoantigens.